There are moments of joy, moments of exhilaration and moments of inner calm… and then there are defining moments that change everything. The 2010 Lexus HS 250h is all new, all Lexus and all hybrid. With the introduction of the world’s first dedicated luxury hybrid, the 2010 HS 250h, Lexus brings attainable, sustainable luxury to Canadian luxury consumers. In the process, the brand also elevates luxury transportation with advanced engineering and intuitive, driver-inspired design that offers excellent roominess and nimble manoeuvrability. Designers and engineers took the opportunity to create a truly unique luxury car that maximizes fuel economy while further shrinking its impact on the planet by using ecologically advanced materials, cleverly packaging components and eliminating waste where possible. Outstanding fuel economy is the inevitable result. The HS 250 achieves an estimated combined fuel consumption rating of just 5.7 litres per 100km (5.6 / 5.9 L/100km, city/highway), and a Tier 2 Bin 3 emissions rating. The HS 250h delivers 54 per cent better city fuel efficiency compared to the average entry luxury vehicle. a full suite of Lexus handling and braking technologies, including Vehicle Stability Control (VSC), Traction Control (TRAC), Hill-start Assist Control (HAC), and more. The Lexus HS 250h Premium model, with a manufacturer’s suggested retail price starting at $39,900, is loaded with luxury comfort and convenience features, including leather seats with 8-way power adjustable driver and front passenger seats, an audio system featuring integrated XM Satellite Radio and USB audio connectivity and distinctive 17” aluminum alloy wheels. The Lexus HS 250h Premium Sport package, with a manufacturer’s suggested retail price starting at $41,400, enhances this unique hybrid sedan with a sport-tuned suspension, 18” aluminum alloy wheels, heated seats, sport pedals, a wallet-sized smart card key, and illuminated scuff plates. The Lexus HS 250h Premium Luxury model, with a manufacturer’s suggested retail price starting at $45,300, delivers the full potential of hybrid-power in an entry luxury sedan, with heated and ventilated seats covered in premium leather and equipped with the Lexus driver seat memory system, the intuitive Remote Touch navigation tool, a voice activated navigation system with integrated back-up camera, 18” aluminum alloy wheels, power rear sunshade and auto-dimming side-view mirrors. The Lexus HS 250h Ultra Premium package, with a manufacturer’s suggested retail price starting at $48,750, adds a wallet-size Smart Card key, a concert-hall quality 15-speaker Mark Levinson Audio system, LED headlamps with headlamp washers, the Lexus auto levelling system, adaptive front lighting system and an automatic high beam feature. The 2010 Lexus HS 250h is available today at Lexus Dealers across Canada. With a manufacturer’s suggested retail price starting at less than $40,000, Canadians in the market for an entry luxury sedan can join the growing community of Lexus guests who have chosen to pursue their perfect moments in life in the world’s only line-up of advanced, intuitive hybrid luxury vehicles. An Atkinson-cycle engine design was chosen for its high efficiency and compatibility with hybrid operation in the new HS. The twin-cam engine uses four valves per cylinder and Variable Valve Timing with Intelligence (VVT-i) on the intake side. The engine is undersquare, with an 88.5-mm bore diameter and 96 mm stroke, and has a relatively high compression ratio of 12.5:1. Peak output equals 147 horsepower and in combination with the hybrid drive motor, the HS generates 187 total system horsepower. It also meets federal Tier 2 Bin 3 exhaust emission standards, emitting 70 per cent fewer smog-forming emissions than the average new car; it is also augmented by a new system that reduces evaporative emissions to near zero. One of the keys to lower fuel consumption involves heat. Similar to the Lexus RX 450h hybrid luxury utility vehicle, the HS employs an Exhaust Heat Recovery System that captures the heat of spent exhaust gases to speed engine coolant warm-up and allow the hybrid system to stop the engine earlier and more often in the driving cycle when it’s not needed, for example in low power demand conditions in city driving. Overall, the system can improve fuel efficiency by as much as seven per cent in low ambient temperatures. The efficient two-motor system also uses an electronically-controlled continuously variable transmission (CVT) that is a model of efficiency, simplicity and compact size with extremely smooth and quiet operation. A motor speed-reduction planetary gear unit helps provide high power output in this small package. The HS250h also uses an easy-to-operate shift-by-wire system that eliminates the need for bulky shift cables, saving space and weight while allowing much more design freedom in placing the shift lever in the interior. The low nose encourages airflow while also helping enhance vehicle dynamics. Smooth transitions along the front fender and A-pillars avoid disturbance of the airflow. Subtle front- and rear-bumper spoilers and an available rear-lip spoiler contribute to low drag and minimize lift. The body sides taper from the centre pillar to the rear where they meet the slightly kicked-out tail lamps, helping reduce drag-inducing wake turbulence. Also, a gull wing-shaped roof panel enabled designers to lower its profile to reduce air resistance and with a shape that is naturally stiffer than a conventional curved roof, engineers were able to reduce its thickness for further weight reduction. Ecological Plastics are used in a number of injection-molded, foam and board components throughout the car, including trunk compartment trim, cowl side trim, door scuff plates, seat cushions and the package tray. Overall, approximately 30 per cent of the combined interior and trunk are covered in Ecological Plastic. The standard Lexus Premium Audio System offers a comprehensive suite that includes voice recognition, Bluetooth® technology, an integrated satellite radio receiver and USB/iPod® connectivity operated via steering wheel controls or from the display screen. A multi-information display situated in the instrument cluster keeps the driver informed of the numerous actions controlled by the steering wheel-mounted switches. The HS 250h’s next-generation navigation system is optional and features Lexus’ exclusive Remote Touch controller with user-adjustable haptic feedback. The innovative controller, similar to a computer mouse, eliminates the need for touch screen controls, allowing the pop-up navigation system screen to be mounted further up the centre stack and away from the driver. The driver benefits with a clear, high-resolution screen, improved site lines and reduced eye movement. These advances combined with the physical feedback provided by the controller make the system extremely easy to use. Voice command, a casual-language-based voice recognition feature, is standard on navigation-equipped vehicles. This new technology – fully trilingual in English, French and Spanish - allows the driver to give fewer and more flexible, conversational commands in a specific order for easier access to audio, climate, and navigation system functions to help drivers focus more on the road ahead. A multi-information display resides in the centre of the hybrid system indicator. It uses high-contrast organic light-emitting diode (OLED) technology for maximum visibility and indicates various conditions such as fuel consumption, ambient temperature and cruising range. Additionally, several vehicle functions can be customized through use of the display with the multi-information switch. Two more items related to visibility merit mention: Over the years, changes to body structural requirements have made it difficult to keep A-pillars slender, affecting the driver’s field of vision. However, HS 250h designers were able to create a relatively slim A-pillar structure that helps improve visibility without degrading structural integrity. Additionally, the HS uses side glass with a water-repellent coating that improves wet weather visibility and aids defrosting performance. As it is with ride, handling, noise and vibration, the body structure plays a key role in the fundamental safety characteristics of the HS 250h. To help protect the driver and passengers, the body is designed to be strong but strategically resilient to help absorb and distribute energy in the event of a crash. High tension steel components are carefully located in the body structure, doors and other areas to help ensure strength in key areas. Additionally, front and outer rear seatbelts incorporate pre-tensioners with force-limiters to help protect occupants in the event of certain severe frontal collisions. Active front head restraints are also standard. The HS 250h optional navigation system comes equipped with a back-up monitor for additional safety when reversing. The interior of the HS 250h was designed to communicate the high level of innovation inherent in the car with the craftsmanship expected from Lexus products. On the Ultra Premium model equipped with the feature, Lexus’ exclusive Remote Touch navigation system controller is a focal point of the interior design because of the high frequency of interaction with it. The centre stack sweeps rearward to the Remote Touch which naturally meets the driver’s hand atop a “floating” form over the centre console. Switches and displays are neatly arranged for ease of operation and free of visual complexity, courtesy of Remote Touch. Leather-trimmed seats are standard and special soft touch stitched details on the centre stack and instrument hood provide an extra premium touch in the cabin. Interior trim colors include Black leather, new light Water Grey leather, Parchment leather, and for the optional Sport Package on the Premium model, a distinctive Black/Water Grey two-tone leather trim. A high-finish dark gloss trim is featured on the Premium model while the Ultra Premium model has brown walnut wood trim. Front door trim that mirrors the shape of the centre stack and armrest provide a comfortable symmetry. And the steering wheel centre pad appears to float on the wheel, surrounded by control switches that mimic the design and color of those on the centre stack. Efficiency was a priority in the HS 250h body design, with careful packaging of people and components to maximize space and special attention to aerodynamics to reduce drag. But the HS 250h is also a Lexus luxury car and its designers were very intent on creating a distinctive, appealing design. The HS250h will offer 6 premium Lexus exterior colors: Matador Red Mica, Tungsten Pearl, Smoky Granite Mica, Obsidian, Black Sapphire Pearl and a hybrid exclusive color - Aurora White Pearl. Standard 17-inch aluminum alloy wheels on the HS 250h are shod with P215/55R17 all-season tires. Available 18-inch aluminum alloy wheels are equipped with larger P225/45R18 all-season tires. All wheels feature the direct-type Tire Pressure Monitoring System (TPMS). Lexus’ experience with Electric Power Steering (EPS) continues to evolve the system. The vehicle-speed sensitive steering has been optimized to provide ideal steering feel at any speed. Inertia compensation control, friction feedback and recovery control assist in tailoring the steering feel and effort. The HS EPS system also helps improves fuel economy by reducing parasitic losses. Leather-trimmed seating is standard with an 8-way power-adjustable front seat, including power lumbar, for the driver. The front passenger also receives a standard 8-way power-adjustable seat. HS 250h Ultra Premium grade receives heated and ventilated 8-way power front seats trimmed in semi-aniline leather. Climate control in the HS 250h is designed to provide comfort and clean air for all passengers. A dual temperature control system is used for front seat occupants and a dedicated rear blower mounted in the centre console promotes quick cool down for the rear passengers. A plasma cluster ion generator, A/C clean air filter and a pollen removal mode help clean air inside the cabin. The interior gets a little extra help from the windshield, which has infrared-ray reduction properties that help keep the interior cool, allowing a smaller size air conditioning system than would otherwise be required. A 10-speaker, 137-watt Lexus Premium audio system featuring a six-disc CD changer, a subwoofer and centre speaker is standard. The system uses two-way woofer and tweeter systems in both front and rear for rich, clear sound quality. The HS250h accommodates a variety of music sources and includes standard auxiliary and USB inputs, Bluetooth® audio wireless connectivity and an integrated XM® satellite radio receiver. Standard voice recognition and Bluetooth technology allow phone calls to be made and received while driving. When an iPod® is attached via the USB port, information such as names for the artist, track and album is displayed on the audio or available navigation screen. All Lexus hybrid vehicles are covered by a 96 month/160,000 km warranty on all hybrid-related components (applies to the battery control module, hybrid vehicle control module, hybrid vehicle battery and the inverter/converter). 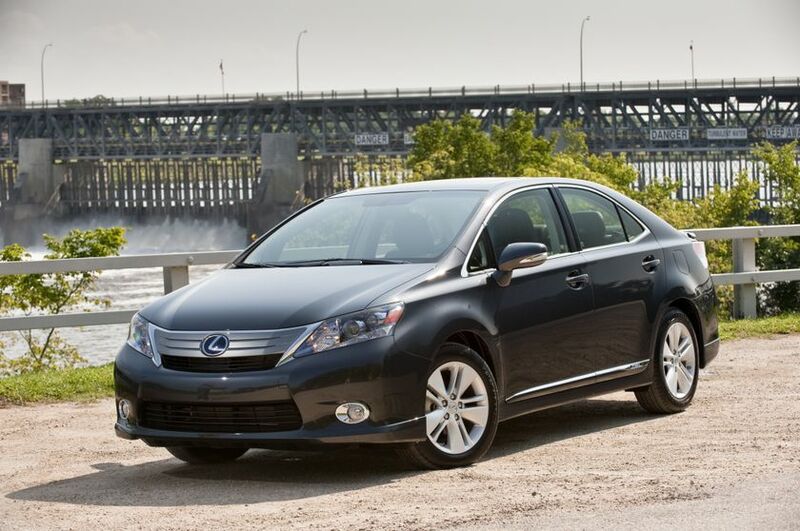 A basic 48 month/80,000 km warranty applies to non-hybrid components. Powertrain and safety restraints are covered for 72 months/110,000 km, while tires are covered for 48 months/80,000km and corrosion/perforation is covered by a 72 month/unlimited kilometre warranty. All Lexus hybrid vehicles benefit from 24-hour roadside assistance for the first 4 years (unlimited kilometres), after the original registration date.